Time cahnges so does fans…..
Oh yes patriotism for money now! Very true. Cricket is like a money making machine now. Thank u Richa … the doodle was inspired by real life experience … back in 96 when India lost to Sri Lanka at Eden where Kambli was seen crying .. I know so many of us still school kids cried .. as if we had lost our family member..I remember not meal .. that night and an afternoon to follow.. today i see on of those die-hard cricket fan of mine , working for a MNC doing bet among a small circle of his colleagues.. just for fun !! The question is have we also not changed our approach toward the gentlemen’s game ..? 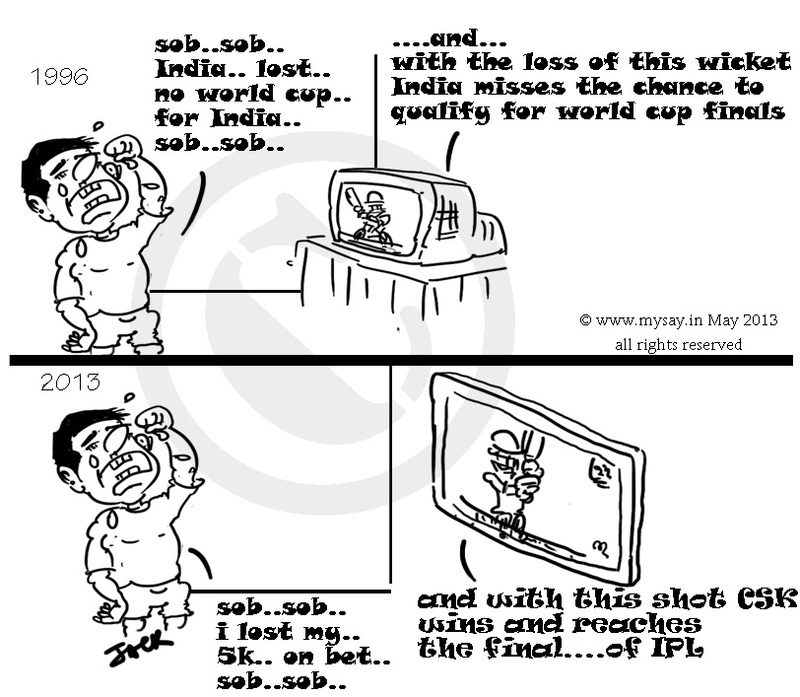 why blame Vindoo .. Sree.. BCCI..IPL .. all alone !? May be in kid’s eye, it is still a lose as you felt back then in 96. My nephews discuss cricket the same I used to do as a kid. They don’t show signs of affect of this fixing. May be in those days while we were crying with Kambli for not qualifying, some people among our parents generations were worrying the money they put on bets. Its the same story, we change the phase. Well thats my perspective. May be totally wrong. I agree with you… why blame IPL or BCCI.. they are doing it because we are driving them… its a shame on all of us quite seriously. We dont realise but we are party to almost all kinds of wrong doing in this country..
thanks Vikram !! 🙂 Appreciate your compliment friend. Yes, what really matters is the money involved, not the game !!! In my opinion, Would have been perfect if CSK won and Fan sobs for his loss… Nice doodle once again..!!! indeed Jeet !! You are so very right !! Thanks…Kisi ko toh mere salaah ki kadar hui… 🙂 Great..!!! 🙂 mere liye to important hai your advise undoubtedly !! well no game seems to be played for what it was meant to be played. There is no sportsmanship! Everywhere people see only money! no one seems to be content! hahahaa!! So true … u always catch me by my collar .. hahaha.. i try to escape .. but .. hahaha..
so true ! emotions less .. materialistic more ! IPL = WWF. Someday later Cricket = WWF who knows? trying not to break my sentiments with cricket … but i am so tired of this spot fixing deceit ! its taking me away ! I try to hold on and give it one more chance ! but it disappoints me every-time ! now i shall no more ! Time changes drastically and people mellow with ages and changed circumstances. so very true sir !! yes Rats .. money minded organizers players entertainers and mangoes .. most of us !! Lol! Match winning through Money . Nicely put in! Ha…ha…great one…it reminded me of the Semi finals v/s srilanka @eden….i was crying like hell…along with Vinod kambli…as he was crying in the pitch…that match got over without india being bowled out and India didn’t play 50 overs also…the match was stopped because of the rage of the public who set fire in the stadium…and were throwing whatever they could to the ground …!!! aar mone koriyo na bhai.. it is a milestone in my life… turning point.. i left playing cricket and watching too .. 2011 never bought me any happiness..as much as it could in 96 .. saala kende ekaakaar … my mothr still recalls .. that fate-less night and next day when they saw I was an Indian first and her son after that . Can they be called fans? Lol! Well said!as long as we bet, they will enjoy ! All the time only loss. Because of such fans and players who support them the real fans and real players are getting affected! The spirit of the game is diluted. Beautifully done My Say! I am glad this happened… men of our country wasted time watching this, hope they learn a lesson! 😀 hehehe !! they who watch they will.. no matter what ..
thank you very very much Ritesh my dear friend !! 🙂 makes me glad !